Winter is here to stay. The snow has hit the ground and we might not see grass for a couple of months, but for many people in Hutchinson this is great news. You’ll see snow mobiles and ice houses all around town – many of which may have come from B&B Sports and RV! B&B Sports opened its doors in 1992 at 20271 Hwy 15 North in Hutchinson. The business was started by Butch Hausladen and is in the same location today as it was over 27 years ago. Jeremy Crosby helped the shop when the business first started and took on a full-time position in July of 2011. He became part owner in 2012 and took over as majority owner in January 2018. What does this tell us? That the people at B&B know their stuff! There are five full time employees working at B&B sports and each of them strive to provide the best customer experience possible. One of the best things about the people about B&B is their honesty and integrity – they create great experiences for people and if things don’t go perfectly, they help make it right. They try their best to get what the customer needs or give them options on where to get it. B&B Sports is a dealer for Crestliner, Larson, KZ RV, Ice Castle Fish House, United Enclosed trailers, and Mercury Outboards. They have a full-service Camper & Fish House shop for most makes and models. They also service most makes and models of boats along with servicing Mercury motors, and Johnson/Evinrude outboards. Most people don’t realize that they also stock a lot of parts/accessories and have the experience to help get customers the correct parts. If they don’t have the number of parts you need, they can usually get what you need the next day. So, whether the snow is falling in the middle of winter or you’re basking in the summer sun, visit B&B Sports to add a little fun to your outdoor experiences. What does B&B Sports & RV enjoy most about their Chamber Membership? We like the support and awareness being a chamber member offers. Internet, TV, phones, and computers… what do all of these have in common? They have all become essentials in our everyday lives AND are all items that are provided or serviced by our August Business of the Month – Nuvera. Nuvera first came to the Hutchinson community 10 years ago and has been offering our residents and businesses top quality products, connectivity, and customer service ever since. Nuvera believes customizable solutions and superior customer service are key in building trustworthy relationships with the community. They know that in order to deliver the very best service to their customers, they need to start with providing the best work environment to their employees, which is why Nuvera focuses on an engaging and empowering company culture. For over 110 years, Nuvera has had a commitment to growth and innovation. While products and services may change with the times, one thing that remains the same is their dedication to excellent service, customized solutions, and friendly local support that families, individuals, and businesses of all sizes can rely on. There is a local customer solutions center in Hutchinson where experts are on hand to help you with your needs. Nuvera also has customer solutions centers located in New Ulm, Glencoe, Goodhue, Litchfield, Redwood Falls, Sleepy Eye, Springfield, and Aurelia, Iowa, staffing over 150 support experts that you can count on. What does Nuvera enjoy most about their Chamber membership? What’s Happening in July 2018! 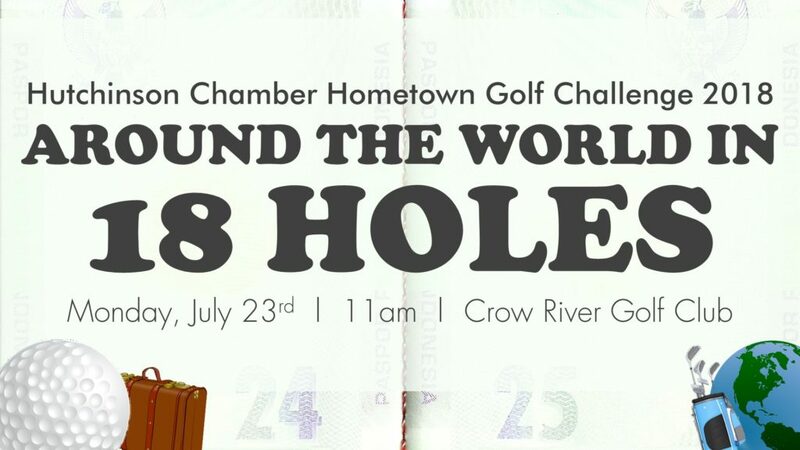 Are you ready to travel “Around the World in 18 Holes” with us? The Hutchinson Chamber’s Hometown Golf Challenge is on Monday, July 23 at the Crow River Golf Club. Check-in and in-flight lunch begins at 11 am, with a shotgun start at 12 pm. The final destination dinner, program, prizes and announcing game winners at 5 pm. There will be a $500 GUARANTEED shoot-out winner, as well as the option to upgrade your game by purchasing a passport package that includes mulligans, raffles, course games. Don’t miss out on your chance to win one of the cash prizes! Will you could be the 1st place winner or one of the two randomly drawn teams? Or better yet, will your team be the best team costume, best decorated cart or best costume & cart combo? Your ticket price of $125 includes: cart, green fee, lunch and dinner. Click here for the 2018 Hometown Golf Challenege registration form and Information (pdf) or click here to register your team online for the 2018 Hometown Golf Challenge. We have many different sponsorship opportunities available. Click here for a 2018 Hometown Golf Challenge Sponsor Form (pdf). We are going crazy this year on Crazy Days! Each business can choose their own Crazy Days theme. Yes, that’s right… you decide on a theme to bring customers in and move product out. If your business would like to participate in Crazy Days, click here to email Gina at Chamber office. Let us know what your crazy deals are and we will help promote your Crazy Days sale! Click here to check out participating businesses! Questions? Click here to call the Chamber office at 320-587-5252. 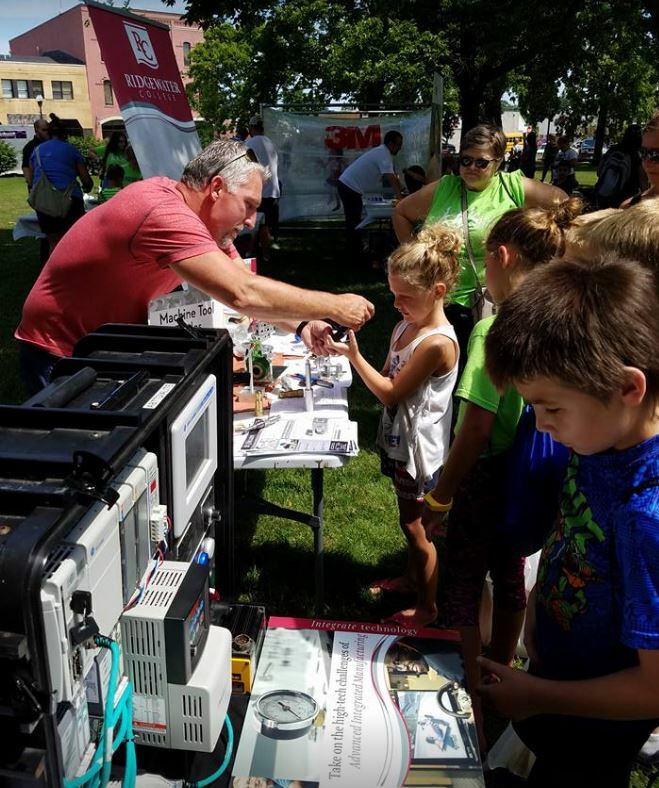 On Friday, July 27, 11:00 am – 2:00 pm, manufacturers and educators in McLeod County will be in Library Square Park providing an interactive afternoon and engaging with community members. Come and learn who they are and what they do! While learning through play and activities. Also from 11:00 am – 1:00 pm, the Hutchinson Downtown Association is hosting a $5 picnic-style lunch. Please join us for Picnic in the Park! Manufacturing in the Park and Picnic in the Park coincide with Crazy Days. 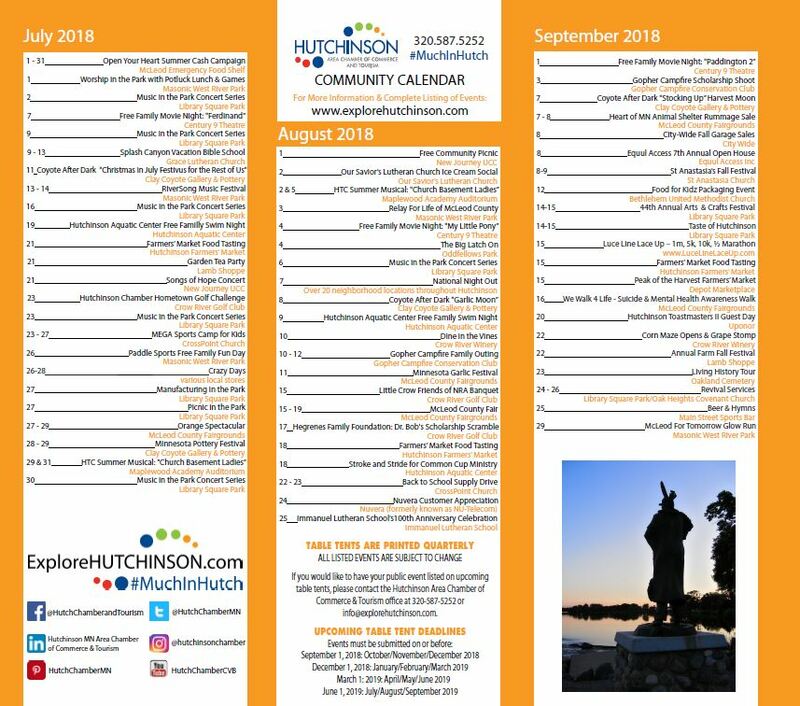 Hutchinson Leadership Institute & Leadership 2.0 Enrollment for 2018 – 2019 is now open! Piehl, Hanson & Beckman, P.A. In July we will be highlighting Elena’s Bakery as our Business of the Month. 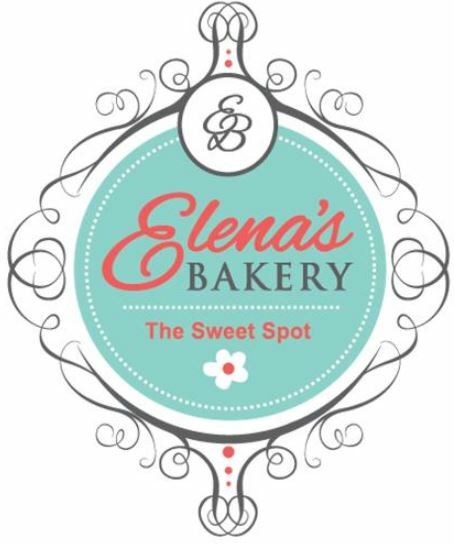 Click here to learn more about Elena’s Bakery. Business After Hours is not held in June, July, August or September. One of the MOST beneficial chamber programs we have for businesses is Hutchinson Leadership Institute. Leadership Institute is celebrating its 30th year during our 2018-2019 session. Its longevity is based on a core group leading the content; keeping it fresh with today’s business climate and reactive to participants’ needs. The Quarter 3 Table Tents are ready!